Immobilisation of the shoulder joint in abduction position at approx. 50° - 60°. 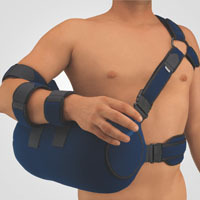 2-compartment system to prevent undesired anteversion of the upper arm in the shoulder joint when lying down. Upper arm pad cam be freely positioned to provide for additional immobilisation of upper arm. Exceptionally lightweight design. Comfortable hand rest; enables forearm muscles to be exercised.